The easiest way to explain Intent is by reading a quote from Google’s own Senior Vice President Amit Singhal (former–he left Google this week) who said, “people communicate with each other by conversation, not by typing keywords – and we’ve been hard at work to make Google understand and answer your questions more like people do.” What they have been working on is to deliver search results based on User Intent. Information retrieval is the name for the process or method whereby a prospective user of information is able to convert his need for information into an actual list of citations to documents in storage containing information useful to him. It is the finding or discovery process with respect to stored information. It is another, more general, name for the production of a demand bibliography. Information retrieval embraces the intellectual aspects of the description of information and its specification for search, and also whatever systems, technique, or machines that are employed to carry out the operation. Information retrieval is crucial to documentation and organization of knowledge”. Named–entity recognition (NER) also known as entity identification, entity chunking and entity extraction), is a subtask of information retrieval (IR) or extraction that seeks to locate and classify elements in text into per-defined categories such as the names of persons, organizations, locations, expressions of times, quantities, monetary values, percentages, etc. [Jim]Person bought 300 shares of [Acme Corp.]Organization in Time. In this example, a person name consisting of one token, a two-token company name and a temporal expression have been detected and classified. (N.E.R). Google explains it like this, “For example, if you search for ‘principles of physics’, Google algorithms understand that ‘angular momentum,’ ‘special relativity,’ ‘big bang’ and ‘quantum mechanics’ are related terms that could help you find what you need,” wrote Ori Allon, technical lead of Google’s Search Quality team, and Ken Wilder, team engineer at the company’s Snippets project on their blog. Use independent topics instead of terms! Use close variants. This would include, singular/plural forms, misspellings, abbreviations and acronyms, and stemmings (like “floor” and “flooring”). Synonyms (like “quick” and “fast”). Related searches (like “flowers” and “tulips”) are not considered close variants. The illustration below outlines the relative reach of different keyword match type strategies. As it shows, modified broad match keywords that match more searches than the equivalent phrase match keyword, but fewer searches than the equivalent broad match keyword. Match behavior also depends on the specific words you modify. For example, the keyword formal +shoes will match the search “evening shoes,” but the keyword +formal +shoes will not. Concepts have become more important than individual keywords for SEOs or Search Marketers. This is called Smart Keyword Research, and it will continue to have a huge advantage over the competition who uses old school tactics. The new methodology today is turning your keywords into Concepts (themes). What is the user intent. Google search engine (and search engines in general) try to understand what the user is truly seeking when entering a search term (keywords) onto the google search field. The search engine tries to relate the user input keywords to concepts that are relevant. In scientific terms this is part of information retrial and it is called “Precision — (which also called positive predictive value“). What is the page’s content theme. The engine reads the contextual words (keywords) on the page and makes sense of it forming a Theme Concept (the scientific term is “Recall” (which is also known as sensitivity). Now it relate this theme concept to the location of “Germany Europe’s eurozone” and relates it to other topics such as news, documentaries, biography of David Cameron and Angele Markel. It will go as far as showing images, videos of the two together at other events, and this is the basics of Entries. In pattern recognition and information retrieval with binary classification: Metrics of Precision and Recall. Groups of Theme Concepts are called entities. It is a singular person, place or thing. For example, one thing could be named in different ways or vise-versa, one word could mean many things. So by using the process of identifying millions of identities and what other sites use to relate to them, Metaweb (now Google Knowleage Graph) builds a map of single words into entities to show how they are related. Entities are smarter than words. “It’s a collaborated process that involves the online community” of things, people and places. The use Keyword tools alone wont give you the best optimized list of keywords. To get closer to getting a list of themed keywords use Google Adwords’ Keyword Planner. It suggests keywords to you in tightly grouped themes and ideas that are better indicators of user’s search intent, then keywords alone. Search engines grouped keywords into concepts and themes. Relying on keyword research tools alone won’t bring your site to its full ranking potential. You need good content that fully explores your themed concepts. A hack to turn your keywords to themes is to use the WordStream Free Keyword Grouper. If want to save time, use WordStream. This tool allows you to import your keyword list ant it will group keywords by themes. From the keyword segmenter, you can select one or several terms simultaneously to create your groups from. Once you’ve decided which keyword(s) you’d like to place into themed groups, click “create” and your keywords are filtered appropriately and instantly. You repeat creating more granular keyword group themes and filtering your keyword groups until you have a full keyword hierarchy. If this is beyond the realm of your skills, make sure to request this from your developer or technical seo expert. For an easy and quick explanation of Knowledge Graph Google put this presentation together. This is a video from Google provides a graphical example of themes, concepts and entities and how the Knowleage Graph works. Note: Bare in mind that Google calls it “list” and “Collections.” That was done with the intent to explain things easier. So far in this article we have called Concepts many names (themes, list, recall, sensitivity, N.E.R). The reason being is that because it is all knew to online marketing and to the internet, mind you. With time, the invisible hand will adjust to just one name that reflects the majority consensus. I listed all of them, so that when you go online and see other names, it does not creates any confusion. Here is an visual representation of how an entity look like in the Knowledge Graph database. Google knows that concepts (themes) are often a better indicator of searcher intent than individual keywords. Marketers who invest in smart keyword research will continue to have a huge advantage over the competition. The Knowledge Graph Learn more about one of the key breakthroughs behind the future of search. 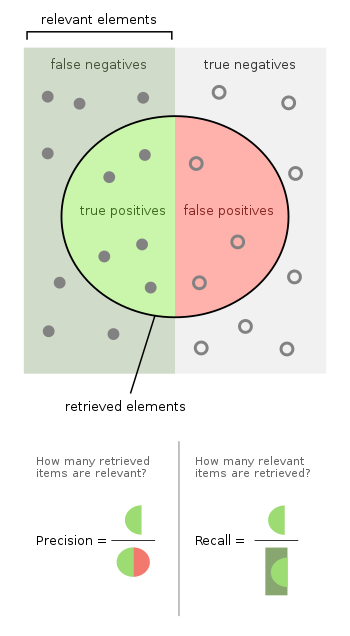 metrics like precision and recall.